When talking about sequels, two genres seem to be referred to more than any others: horror and comedy. They’re cheap to make, don’t always require big names to attract an audience, and will generally attract said audience by virtue of being an easy watch (whether that’s the case or not). Comedy sequels rarely retain the charm or gag-to-laugh ratio of their predecessors, even if the same cast/director/screenwriter returns; the original idea, if done right, should have had all its comic potential mined from source, so that any follow-up has really got to go the extra mile to work anywhere near as well. What you get – usually – are the same jokes rehashed, the same characters held in development stasis, and maybe some new characters that don’t add anything new to the mix. When a comedy sequel arrives so long after the original, you have to wonder at the reason for it, and will it have anything new to say? The reason is usually a financial one (it’s a very rare sequel that’s made under the auspices of “artistic merit”), and in terms of having anything new to say, well, let’s just say you shouldn’t count on it. Here’s a “great” example. David Spade is the member of Adam Sandler’s “posse” whose career has been made up of appearances on TV, supporting turns in his pal Sandler’s movies, and voice work in a multitude of animated series and features. In 2001, he co-wrote and starred in a movie called Joe Dirt. It was about a man searching for his parents (who abandoned him as a baby), and the man, Joe, was a complete idiot. The movie wasn’t brilliant, but it wasn’t awful either; instead it occupied that middle ground where there are as many good things to say about it as there are bad. And it was funny in places, really funny, and Spade made the best of a rare leading role. Fast forward fourteen years and Spade is back, co-writing (with director Fred Wolf, who also co-wrote the first movie) and starring in a not quite inevitable sequel. The same narrative structure is used as in the first movie – Joe recounts a journey he’s taken, this time going back to 1965 and traversing the years until he reaches the pivotal moment where he meets his wife, Brandy (Daniel) – and along the way he finds himself in all sorts of trouble while admitting to anyone who’ll listen that he’s as dumb as a box of spanners. Of course, this being a road movie of sorts, it’s also about Joe taking a journey of self-discovery and realising what’s really important (his wife and family, being true to oneself, having a good heart – the usual drivel). But Spade and Wolf have a secret agenda. 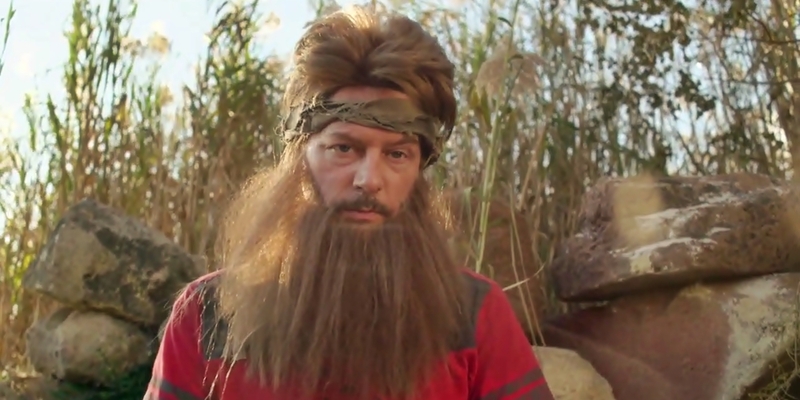 As Joe Dirt 2: Beautiful Loser finds its time travelling groove, and goes about ripping off elements from The Wizard of Oz (1939), Back to the Future (1985), Forrest Gump (1994), and Cast Away (2000), the movie can’t help but have Joe interact with various moments in US history, particularly an encounter with the founder members of Lynyrd Skynyrd when they were still The Wildcats that ends abruptly when they mention being rich and successful enough to own their own airplane. It’s a scene obviously shoehorned into the script to be both amusing and maudlin at the same time, but thanks to the number of suggestions that Joe makes, all of which will ensure the group’s fame and fortune, the scene falls flat, and loses whatever bittersweet poignancy it may have aimed for. It’s the same for most of the movie, as scenes lacking any subtlety (the scene with Buffalo Bob, a “future” scene involving vodka soaked tampons) vie for attention with scenes that are meant to be heartfelt. But sadly it doesn’t matter what the tempo or mood of any given scene, thanks to Wolf’s casual approach to directing, they all feel as if they’ve gone on too long, or that the meaning of the scene has been eclipsed by the need to include a joke or bit of business that doesn’t work. It all leads to long stretches where the narrative stalls unnecessarily and any momentum the movie has managed to attain is kicked to the kerb. Of course, being a sequel, the movie does its best to bring back as many of the original cast as possible. This is usually a good thing, as the familiarity of the characters is (hopefully) maintained along with a great deal of goodwill towards them; when they show up, the viewer is meant to be happy to see them. However, Spade aside, none of the returning cast get very much to do. Daniel is sidelined for much of the movie, Walken pops up for three scenes (and coasts through all of them), Beach gets a cameo, and Miller acts as an occasional prompt for the narrative. Of the newcomers, Warburton gets the lion’s share of screen time but never seems like he’s connected with his character(s), while the only thing that McGrath does of note is to name check himself in the scene relating to the vodka soaked tampons (and weirdly, not in a good way). Like many sequels, Joe Dirt 2: Beautiful Loser tries hard to justify its existence but never succeeds in stating a good case for itself. Much of the humour is forced, and on a couple of occasions is reliant on Spade’s verbal dexterity, leaving the movie feeling like the vanity project of someone who’s easily persuaded that the material they’ve come up with is more than enough to gain critical and commercial approbation. Alas, in this case, that’s not true. At best, the movie is inoffensive (even when it tries its best to be offensive), at worst it’s a disappointing, unrewarding exercise in recreating what little lightning was in the original bottle. Rating: 4/10 – slackly directed, and edited to the point of distraction by Joseph McCasland, Joe Dirt 2: Beautiful Loser is a sequel that spends more time riffing on other, more successful movies than creating something new and effective; Spade is fine as Joe, but as this is his baby he should bear the responsibility of what is ultimately a shoddy, sporadically amusing misfire.